In the Gospel of John chapter 9, Jesus chooses to use a blind beggar to preach his gospel and spread his kingdom. Blind without job or education, this is not the man any of us would choose to send as a missionary. Yet the Lord not only uses him but indicates that God the Father set him here for this very purpose to manifest the Glory and Grace of God. It is this man and not the Pharisees and Scribes, who spent their life reading and studying the word of God, who was to be God’s prophet in this city. At times this may be a warning for us, lest we become puffed up with pride in our own understanding and learning like the Jewish leaders. At other times it may warns us, lest we judge those who serve the Lord, thinking they are not fit or worthy because we see this or that defect in them. But to those who may be weighed down by their own short comings and sins it is a joyful comfort to know that the Lord can use even a blind beggar such as me to accomplish his work. 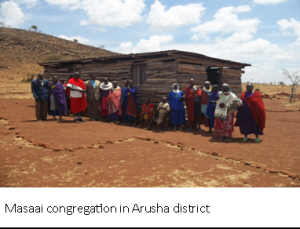 At the beginning of last year, the CLC Mission Board took a new approach to the CLC’s work in East Africa by calling an additional Part-time missionary to assist in the work the Lord has given us in that part of the world. Pastor Mike Gurath was called to work with our brethren in Kenya and Uganda, and my call was changed to work with our CLC pastors and congregations in Tanzania. Pastor Gurath made his first trip as missionary to Kenya and Uganda this past summer, meeting and working with the CLC pastors in that area, and my visitation took place in November. This year we expanded to four districts in Tanzania (Arusha, Moshi, Makanya, and Tanga) and I spent 3-5 days per district, conducting seminars with the pastors and looking over the work being done in each area. I conducted three two day seminars. The first was held in the Arusha District with Pastor Jeremiah. The second was hosted by Pastor Malyi and the Moshi District in Marangu. And a third was held in Korogwe for the Tanga District. 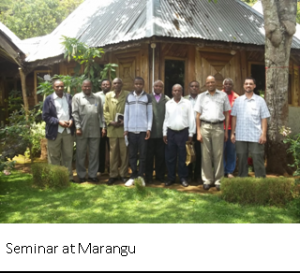 In the past we have always hosted a CLC General Pastoral Conference in East Africa where representatives from our CLC districts in Kenya, Uganda, Tanzania, Zambia all came together for study and fellowship. 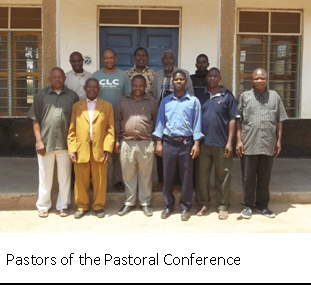 Because of the call of the second part time missionary to East Africa and the resulting reorganization, changes had to be made to the CLC General Pastoral Conference as well. Pastor Gurath assisted with a Kenya/Uganga General Pastoral Conference, and I helped organize the first General Pastoral Conference of the CLC-Tanzania. A two day conference was held in Makanya and hosted by Pastor Mshana. This year we began a study of the Augsburg Confession which was aided by the recent publication of the Book of Concord into Swahili. Last year I distributed copies of the newly published book at our district meetings and introduced our pastors and leaders to its contents. The Articles of the Augsburg Confession serve as a beneficial in-depth study of the doctrines presented in the Small Catechism. We plan to continue our study of the doctrines presented in the Augsburg Confession in future visits as well. What a blessing to have this resource available to the pastors and leaders of the churches of the CLC-Tanzania. We thank the Lord for the privilege of learning of Him and serving Him in the work of His Kingdom!